Aleksandar Krsmanovic, the young hero of “How the Soldier Repairs the Gramophone“, doesn’t know why it matters what name you have, only that he has the right name. He enjoys an idyllic childhood in Bosnia until the sudden death of his grandfather, which happens at precisely the same time as Carl Lewis sets a new world record on television. Close to his grandfather, Aleksandar struggles to come to terms with his death, realising for the first time that life is finite, a discovery that inspires him to paint of a series of pictures of “unfinished things”. Then the ethnic wars, which have already visited neighbouring countries, start to creep towards Višegrad. As children, shielded from much of what is happening, Aleksandar and his friends don’t fully understand what’s going on “These days everyone is leaving town, no one knows where they are going”, Aleksandar writes in his notebook. Huddled with their neighbours in the cellar of his grandmother’s building, Aleksandar watches television pictures of burning towns and bodies lying under blankets on the street. His parents tell him that these things are happening a long way from Višegrad, that he shouldn’t worry. Although Aleksandar is unaware of the true gravity of the situation, he knows instinctively that he needs to protect his friend Asija, a Muslim, when the building is taken over by Serbian soldiers. Aleksandar tells the soldiers that Asija is his sister and gives her his grandmother’s name. Soon after, Aleksandar and his parents and one of his grandmothers, Nene Fatima, pack up and flee Bosnia in their battered Yugo. Only when they are on the way does Aleksandar learn why they must hurry; they may all have the right name, but his mother is from a Muslim family. When Aleksandar starts a new life in Germany, he finds himself in the strange position of being responsible for his parents as he is the one who learns the language and assimilates into German life. He does well and soon settles in but, true to the promise he made to his other grandmother left behind in Višegrad to “remember when everything was all right and the time when nothing’s all right”, Aleksandar can’t escape the past and, in his early twenties, he goes back to Bosnia, first to Sarajevo where he thinks Asija went after his family left Bosnia, and then to Višegrad, not just in search of Asija, but looking for his family and his past. “How the Soldier Repairs the Gramophone” is a rich and rewarding novel but it is challenging too, not just in terms of the subject matter. Aleksandar tells the story using a combination of recounted memories and stories he has been told by other people. The narration can jump around in places and occasionally I didn’t fully understand what was happening. The stories aren’t presented chronologically and it isn’t always immediately obvious whether the story is Aleksandar’s own or one he had heard from someone else. In spite of these minor confusions, I liked the slightly off beat style of writing which reminded me a lot of Jonathan Safran Foer’s “Everything is Illuminated”. However, there were times when I felt slightly exploited, as if Stanišic was a creative writing student using all the skills he’d learned at once. One feature I did enjoy, though, was the repetition of phrases describing people or events; I felt that this brought me further into the story as if I knew the characters better. Stanišic has the ability to create very evocative scenes, richly woven tapestries of the special occasions in the lives of a close know family. He is also able to move swiftly between comedy and tragedy and high drama. My favourite part of the book was an account of a family party – complete with brass band – for the inauguration of an indoor toilet which starts of full of humour and fun, but has a shocking conclusion. The combination of the sunny day, the sound of the band playing gypsy tunes and the mountains of tasty food were so well described that I felt I’d really been there, gorging on burek and juicy fruit. There is a strong surreal element to the novel which sees references to a catfish wearing glasses, a grandmother who pretends to be from the Wild West and a young Aleksandar who won’t take off his wizard’s hat. The slightly absurd nature of parts of the book seems heightened when juxtaposed with the more sombre elements. I also liked the snappy narration jumping suddenly from one thing to another which enhanced the chaotic nature of life in a war zone and the disjointed memories of a child. It’s not a style that will suit all readers, especially as Stanišic does incorporate some passages written as a stream of consciousness, but it’s one that is worth sticking with. The sections that deal with the war are economic but shocking in what is implied. I found my reaction to them more profound because of the way he places something quite everyday alongside events that are far from ordinary daily life. In one scene, a Serbian soldier closes behind him the door to the kitchen where a young woman is making bread. The readers know what is going to happen when the soldier closes the door, we don’t need to be told, and the fact that Aleksandar tells us that he can recall the smell of the dough as distinctly now as if it were yesterday tells us that, even if he didn’t know why, he knew it was significant. The author is a Bosnian refugee who started a new life in Germany so he does know what he’s writing about. The success of this novel is not just about Stanišic’s experience of what he writes about but the skill with which he writes. His writing is evocative and warm yet never sentimental and he manages to convey the darker side of his story without resorting to gruesome descriptions. Unfortunately the economy of style is not always a positive; a little background knowledge is required to understand some of the events covered in the novel because so much is implied rather than explicit. Nonetheless, this is one of the most challenging and enjoyable reads I’ve encountered for a good while and one I would recommend not just for the sheer delight of reading it but also to learn something of what it is to be a refugee. 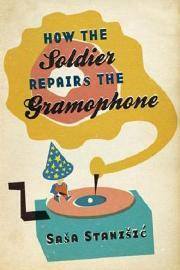 No Comments on "How the Soldier Repairs the Gramophone"